Obtaining and reviewing previous full-mouth series or panoramic x-rays can eliminate the need to take new radiographs. For example, patients with stable periodontal health and a low caries rate may be able to increase the time between bitewings from annually to every 18 to 24 months years (ADA, 2012). If new radiographs are necessary, radiation exposure can be decreased through the use of higher film speeds, shielding, and collimation. HIGHER FILM SPEEDS: Using the fastest film available significantly reduces radiation exposure. Currently, intraoral X-ray film is available in three speeds: D, E, and F. E-speed film is almost twice as fast as D-speed film—and about 50 times faster than traditional x-ray film. F-speed film requires about 25% less exposure than E-speed film and 60% less exposure than D-speed film. Multiple studies have confirmed that F-speed film has the same useful density range, latitude, contrast, and image quality as D- and E-speed films, and it can be used in routine intraoral radiographic examination without sacrificing diagnostic information (ADA, 2012). SHIELDING: The use of aprons and thyroid collars shields the gonads and thyroid gland from radiation exposure, which is particularly important among vulnerable populations, such as children and pregnant women. The ADA recommends that every patient should be covered with an apron. When taking routine bitewing and periapical radiographs, a thyroid collar should be used. Panoramic imaging is an exception to the rule; a thyroid collar can obscure large areas of the target zone (ADA, 2012). COLLIMATION: A collimator is a metallic barrier with an opening in the middle that is used to reduce the size of the x-ray beam, and, thus, the exposure area. Dental x-ray beams are usually collimated to a circle 2¾” in diameter. When an x-ray beam is directed at a patient, the hard and soft tissue absorbs about 90% of the photons, while approximately 10% passes through the patient and reaches the film (ADA, 2012). Although dental professionals receive less exposure to ionizing radiation than do other occupationally-exposed healthcare workers, operator protection measures are essential to minimize exposure. Protective measures include the use of barrier shielding, occupational radiation exposure limits, and personal dosimeters. SHIELDING: When possible, operators of radiographic equipment should use barrier protection, and barriers should ideally contain a leaded glass window to enable the operator to view the patient during exposure. When shielding is not possible, the operator should stand at least two meters from the tube head and out of the path of the primary beam. EXPOSURE LIMITS & PERSONAL DOSMITERS: The maximum permissible annual dose of ionizing radiation for health care workers is 50 millisieverts (mSv) and the maximum permissible lifetime dose is 10 mSv multiplied by a person’s age in years. Personal dosimeters must be used by workers who may receive an annual dose greater than 1 mSv to monitor their exposure levels. Pregnant dental personnel operating x-ray equipment must also use personal dosimeters, regardless of anticipated exposure levels (ADA, 2012). PureWay now offers personal dosimeters that measure the amount of high energy ionizing radiation a person has been exposed to. 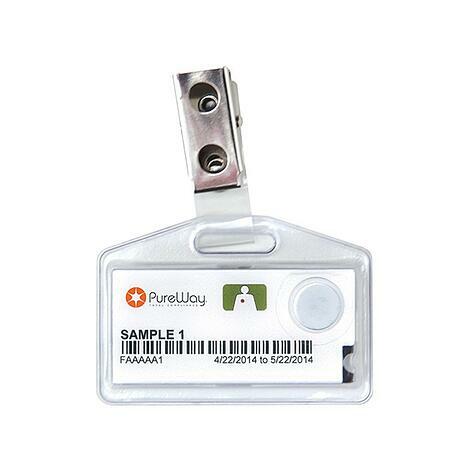 The PureWay Radiation Detection Badge is a small, reliable badge designed for superior accuracy, easy handling and cleanliness.